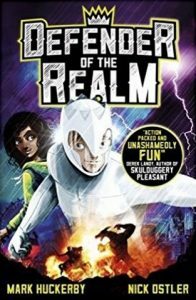 Defender of the Realm, by Mark Huckerby and Nick Ostler, is the story of a reluctant superhero – a very British reluctant superhero. Alfie is a normal fourteen-year-old boy. He hates school, particularly the bullies, feels like he’s a disappointment to his Dad, and feels in the shadow of his more athletic, better-looking, more confident (albeit very slightly younger) fraternal twin brother Richard. Except he’s not a normal boy. He’s His Royal Highness, Alfred, Prince of Wales, eldest son and heir to the King of the United Kingdom of Great Britain and Northern Ireland. He’s not ready, of course. He never wanted to be King – surely it would have been better if he’d been born just after Richard? It’s just so unfair! But ready or not, Alfie has the crown thrust upon him. Little does he know just how unprepared he is. Because being the monarch of the United Kingdom isn’t all opening sports centres, attending galas, and waving from limousines. When Britain is threatened, only the heir of Alfie’s nameseake King Alfred the Great can take up the mantle of the Defender. Who is, for want of a better word, a superhero. Which is just as well, because there’s a dragon roaming around Britain causing chaos, and only the Defender can stop him. Mark Huckerby and Nick Ostler have written a proper comic-book adventure in novel form. In this adventure he’s aided by his bodyguard and armourer Brian, the Lord Chancellor, and Hayley, who lives with her royalty-obsessed Gran and is caught up in the chaos when the dragon attacks the Tower of London while they’re watching the Ceremony of the Keys. Hayley’s a great character, and helps keep Alfie down to earth, as well as providing much-needed technological support – the Defender’s armour and weapons haven’t moved on much since the Dark Ages, so Hayley’s addition of radios and cameras to his arsenal allow Brian and LC to support their inexperienced reluctant hero a lot better. It’s Alfie’s reluctance that forms the emotional journey. He never wanted to be King. He certainly never wanted to be the Defender. And when there’s a ready-made, more athletic, better-looking, more popular replacement at hand – well, it’s not like there’s never been an abdication before. This is a superhero origin story, and packs a lot of background in while never forgetting to keep the plot racing along. Alfie and Hayley’s adventures aren’t over, and not all of the monsters are defeated – it will be interesting to see where the series goes from here.